Itinerary/Route today: La Carlota City to Valladolid, Negros Occidental to Cabalagnan, Guimaras then Yato Island, Guimaras ( with 2 islands stop-overs during the boat ride). Breakfast is ready when I woke up. Thanks again to my host, K! But I decided to go to the Plaza and the Old Church to take some pictures, then to Central Azucarera de La Carlota before eating breakfast. Then, I encountered some problems with Central Azucarera security because they won’t allow me to take pictures of the old train. I don’t want to argue so I used some diplomacy and a little bit of intimidation (saying I’m a writer and I will write about how you treated me, etc… hahaha! it worked!). After about an hour of talk, I was allowed to take some pics…see below, I took a lot of pictures even of its parts. 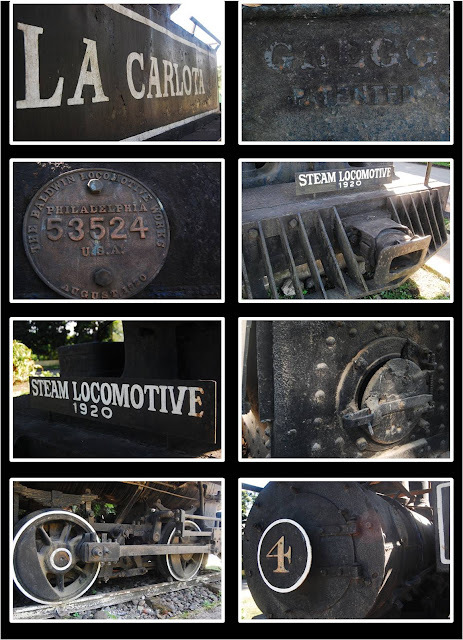 The officer told me that the “Iron Dinosaur” (old train) is still working up to this day. After breakfast, I packed my things, said good-bye to my bed for the last 2 nights (I can feel that I will sleep on my hammock again). 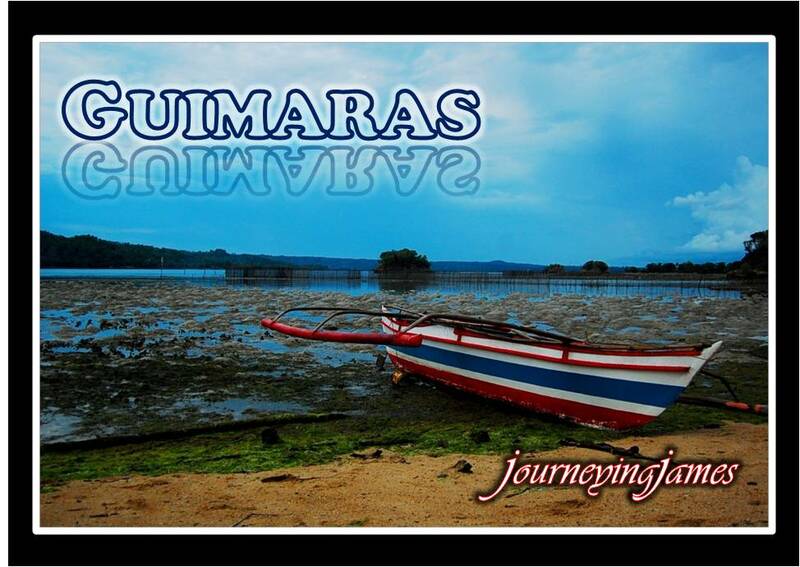 I really want to stay for another day but I have to get going… Off to Guimaras I continued my journey. I’m excited to taste the sweetest mango in the world. So I went to Valladolid port (about 30minutes from La Carlota City taking the minibus) at 9:00am, just before the pumpboat/outrigger boat is about to leave. The boat left at exactly 10:15am and we arived at Cabalagnan, Guimaras at 12:15. Just in time for lunch. between 6-7am; 9-10am; and 12nn-1pm. Boatman 1: Where are you going? Boatman 2: Where in Guimaras? James: I don’t know yet. Maybe I will look for an island to spend a night. Boatman 3: What are you doing? Where are you from? James: I’m traveling Negros Occidental, Guimaras and Panay Island for 14 days. Its my 5th day today. I’m from Manila (Pasay to be exact). This is an adventure trip! Boatman 1: Adventure? Great! Would you like to stay in our island? The beach is white. You don’t have to pay anything. Just buy a liter of gasoline and we will bring you to Yato Island. James: Really? Sure! I will go there. Thanks! We continue to have our conversation. I enjoyed my time with them. Salamat mga Mig! La Carlota City Plaza. 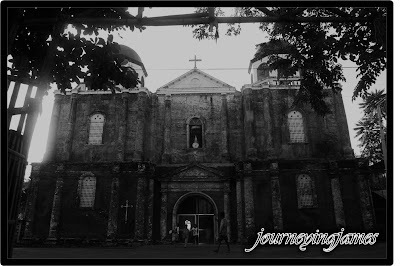 Where you can see Andres Bonifacio sculture and Rizal Monument. I think its better to visit it in the evening for I saw some food kiosk- a sampling of some local produce. 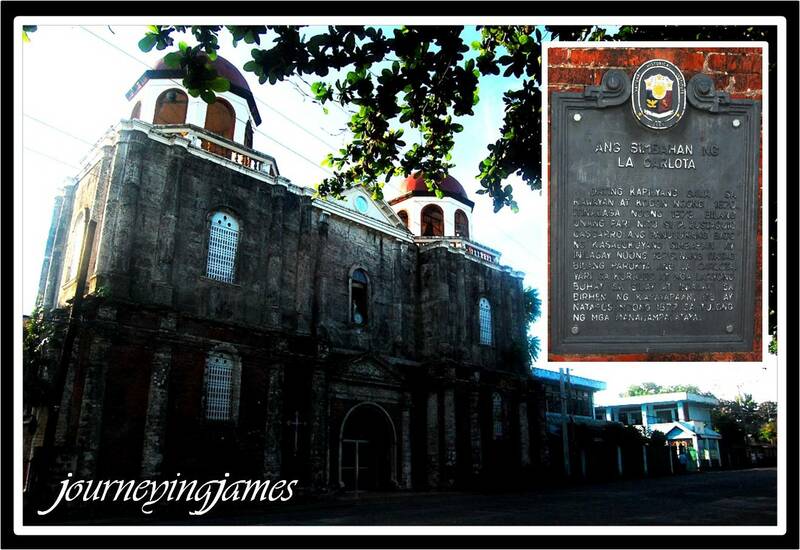 La Carlota City Old Church. One of the very few churches of Romanesque Architectural design with its semi-circular arches, Our Lady of Peace and Good Voyage Church was made by the faithful through forced labor (Polo y Servicios) from red bricks coming from Silay and coral stones from Guimaras. THese stones were mixed with lime and bonded using eggs. Central Azucarera from a far & a shot with the sugar canes on the foreground. Nauway Island, Sibunag. This is the first stop-over. This island is known for their crab culture. The boatmen unloaded the Styrofoam boxes with ice for the crabs. The crabs are to be delivered to Bacolod City. Cabalagnan, Nueva Valencia. I ate my lunch here, a small town with a port. Yato Island. 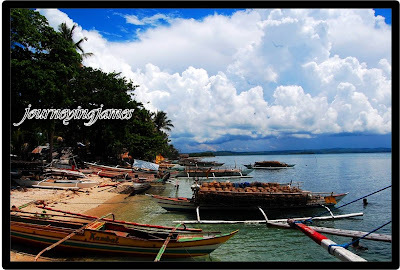 An island off the shores of Guimaras, 10-15 minutes by boat inhabited by 11 families. The community composed of 12 families welcomed me as their own. I was welcomed as a traveler, but I left as a friend to them. Here I met Joven & John Robert’s family More of this on Day 6. I will definitely come again on this island. And because this place is simply amazing and captivating, I will post another blog about it. Revisit to view more of my photos from this small island. Suman. 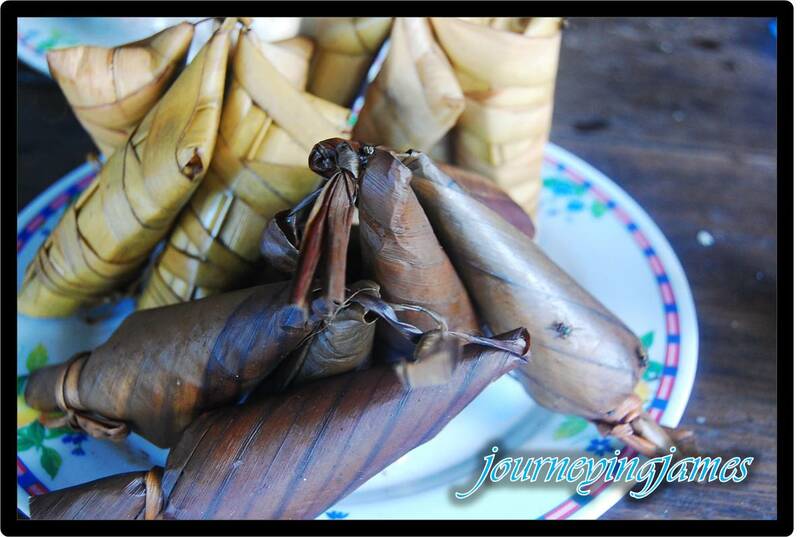 Sticky rice cooked with coconut oil and placed inside a banana leaf or coconut leaf. 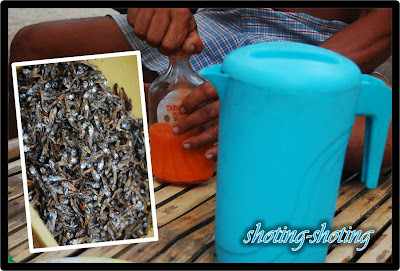 Sirum-Sirum (its like anchovy, but better tasting). Tasted (as pulutan) some while I joined the Yato folks in their “shoting-shoting.” I had two shots of ESQ, again to show them that I’m with them. Very nice and good people. Sir Warlito. The CACI head of security. At first he doesn’t want to allow me take some pictures but because of diplomacy, I was permitted (His “no” for an answer means try harder for me). He even treated me with coffee and bread from their canteen. Thanks Sir! You are doing your job well! Em-em. The baby aboard the pumpboat. Mang Tomy. The captain of the boat, he was serious and hard-working. Look at his eyes reflective of the hardwork he did over the years. They were the ones who pointed me to Yato Island, they actually offered it for an adventurer like me. Cool guys!! Raymund the conductor (one who gets the fare) and co. (See short story above). These people are very nice and cool! They even invited me to have some “shots” of the Bar. Who would deny that offer? In the many travels I did, “shotting-shotting” (drinking) is part of the culture. To drink is to be part of them. It is a string message that you are one of them, and you trust them well enough to use the same shot glass they are using. Hope to meet you again guys! Ptr. Mark and some young people from Calvary Chapel Iloilo. Mr. Congeniality as I am, I smile to people I met. These bunch of cool Christians were with the same eatery the morning I arrived at Cabalagnan, Guimaras. 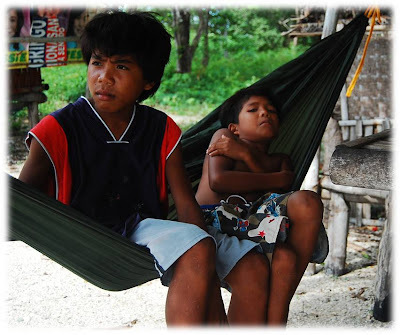 Joven (15yrs.old) & John Robert (10yrs.old). My tour guides, Joven stopped after graduating from highschool. He wakes up early every single morning to fetch water for the family. His younger brother, John is a curious boy, loves the sea creatures and knows where seashells can be found. I feel sad about the condition of Joven and his younger siblings, they don’t have access to informations as what Manila kids have. Their youth is so short that they are expected to be working after highschool. P249 (whew, that was close!). I thank the family of Joven and John Robert who welcomed me to their house, I slept on their kubo with their kids. That was great and I feel I’m part of the family. So, I didn’t pay anything for accommodation. They were also kind enough to prepare me some dinner (rice & pork nilaga). This entry was posted in Uncategorized and tagged Backpacking, Guimaras, La Carlota City, Negros Occidental, Yato Island. Bookmark the permalink. ahahaha! thanks K! accomodation, dinner and breakfast yun. hahai gave them the bread i bought naman. and the suman from la carlota. this is what im doing this long weekend. im going to a place where ive never been to… never featured in blogs yet and no idea of what to see. but what thing for sure… ill find a family too good to share me a place in their home for a night.kakatuwa din talaga pag bumyahe mag isa. How envious!I have never tried backpacking alone.Thanks for dropping by!Have a nice day! you should try one… thepinaysolobackpacker.com do this always. naman! i got hooked na talaga with your 14 days adventure,hehehe.. Day 5 and still the excitement was there..